In 2019, the New Horizons spacecraft will attempt to break the record for the farthest image ever taken of Earth. In 1977, humans launched twin robotic probes into space several weeks apart. The two Voyager spacecraft barreled away from Earth for a tour of our planet’s siblings in the solar system. At each encounter, the Voyagers set records for the best-looking pictures of these planets humanity had ever taken, far better than anything seen through a telescope. There was Jupiter, furiously churning with gargantuan storms. There was Saturn, encircled by vinyl-like rings. There was Uranus, robin’s-egg blue and featureless. There was Neptune, cloud-speckled and cerulean. When the planetary safari was over, Voyager 1 turned back toward Earth in 1990 for one last picture before its cameras were shut off. The resulting photograph, the “Pale Blue Dot” image at the top of this story, became the most distant image ever taken of Earth. Voyager has held onto that record for 28 years. But a year from now, it may get knocked out of first place. “We’ve been talking about it for years,” says Andy Cheng of the plan to take another ‘Pale Blue Dot’ image. Cheng is a scientist at Johns Hopkins University’s Applied Physics Laboratory and the principal investigator for lorri. At that distance, our home in the universe will look tremendously small. “It’ll be very hard to pick out that tiny, bright dot,” he says. The shot will come more than 70 years after the creation of the first image of Earth from space. On October 24, 1946, more than a decade before Sputnik, a V-2 missile launched from New Mexico with a camera in tow. The missile flew for only a few minutes before crashing back down, but its camera managed to capture a grainy, black-and-white view of Earth against the blackness of space. lorri and the other instruments on New Horizons are currently in hibernation. In December, lorri photographed two objects in the Kuiper Belt, a region of asteroid, comets, and small rocks beyond Neptune. The resulting images, which nasa revealed last week, broke Voyager’s record for the farthest images ever taken from Earth. 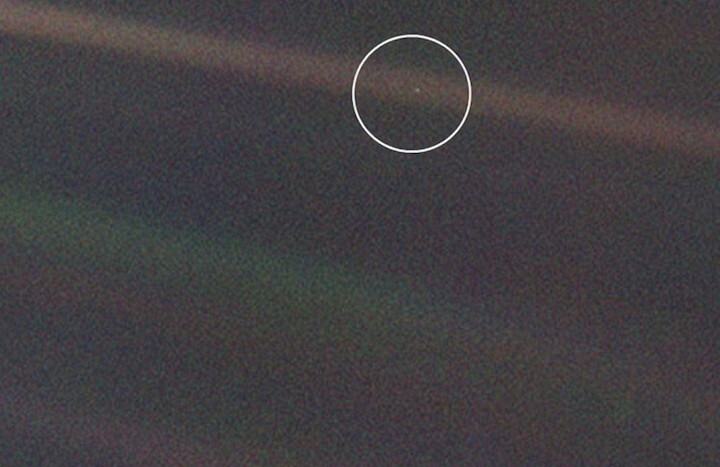 Voyager was about 3.75 billion miles from Earth when it captured the “Pale Blue Dot” image. New Horizons was 3.79 billion miles from Earth when it photographed the Kuiper Belt objects. The spacecraft travels over more than 700,000 miles of space every day. lorri and the other instruments will wake up this summer in preparation for a flyby of MU69, a Kuiper Belt object discovered in 2014 with the Hubble Space Telescope. The object is so far from Earth that even with Hubble’s eyes, astronomers don’t know whether MU69 is one object or two. lorri will solve that mystery next year when it sends back detailed images. After that, it’ll get in position to photograph Earth and try to recreate the famous “Pale Blue Dot” shot. “Taking images and returning them from the greatest distances—it’s just mankind’s reach extending farther,” Cheng says.